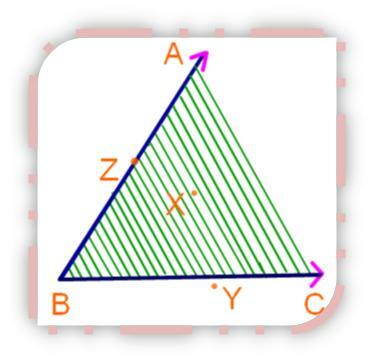 Interior and exterior of an angle is explained here. The shaded portion between the arms BA and BC of the angle ABC can be extended indefinitely. This portion is called the interior of the angle. X is a point in the interior of the angle. The point Y lies in the exterior of the angle. The point Z lies on the angle. In the above figure, here ∠1 is called the interior angle because it lies inside the two arms. 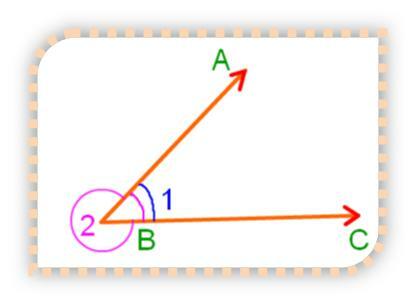 ∠2 is called the exterior angle. Whenever two rays meet, two angle are formed – one an interior angle and other an exterior angle. The size of an angle is measured by the amount of turn or rotation of two arms and not by how long the arms appear to be. Here ∠a is greater than ∠b, ∠b is greater than ∠c.